Are you planning a boating excursion for a group, or are you looking for some extra deck space to lounge? Rent our luxury 24′ Tahoe pontoon boat! It provides comfortable seating, complete with plush upholstery, for up to 11 people, so you and your family and friends can kick back and cruise the Intracoastal Waterway in style. Whether you’re into fishing, pleasure-cruising, nature-watching, or all of the above, this pontoon boat has something for everyone. Take the helm and begin your voyage, hopping from island to secluded island, guided by the included GPS and depth finder — all the while enjoying the shade under the broad bimini top and humming to your favorite tunes on the built-in Bluetooth stereo system. 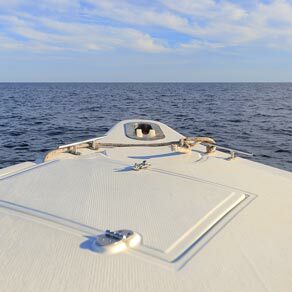 You’re one step away from your boating adventure. Rent this boat today — it’s the easy way to get away!